My cell phone rang on Saturday evening. In winters even 7.00 pm feels like late night. The call went something like this- “Ma’am we are calling from Four Seasons Wine. We have to deliver a bottle of wine to your home.” I vaguely remembered receiving a mail from the Four Seasons PR asking if I would like to review a bottle of their wine. I did not reply to it as they usually ask for a review within 7 days. I was not sure I could do that. So I told the caller that “I won’t be able to review it. Anyway I am not a food blogger.” The person at the other end said, “Ma’am we are standing outside your house.” I apologized and ran out. 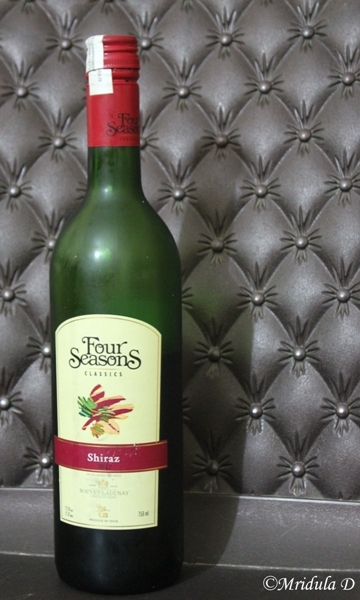 They said “if you can not review it keep it as a gift!” It was a Four Seasons Shiraz, which is a red wine. I thanked the two men who delivered the wine and walked back to the house. I felt a bit silly the way I talked to them. I can be quite straight forward but I do not like being rude. I thought I sounded rude on the phone. But how could I have known that they calling right from my gate? When my husband saw me walking back with a bottle of wine he asked if we should open it? I generally do not drink at home, not even on weekends. But here I was with an unexpected bottle of wine after a working Saturday so I decided why not. Colour : Dark ruby red with black cherry hues. Aroma : Crushed raspberries abound, combining with spicy and smoky notes and a subtle hints of violet. Palate : This rich, full-bodied wine has a nice amount of complexity offering fruit and spice on the palate and a pleasant finish with smooth velvety tannins. Now if you would ask me it simply tasted good. I liked it but I can’t say why. Did I taste black cherries in it? I would be honest, no. My taste buds cannot perform complicated tasks. Same goes for subtle hints of violet. We had it with popcorn. I guess real wine lovers are suitably disgusted by my description if they have read it so far. But this is who I am even after attending a wine tasting session before. But if you ask me did I enjoy the Four Seasons Shiraz red wine I would say undoubtedly yes, I am looking forward to having another glass on Christmas. Before I went to a wine tasting session with Four Seasons I knew a few things about wines. Like it is my favorite alcoholic drink and yet apart from Sula I knew of no other brand (please note no other brand and not no other Indian brand). It is not that I do not drink other brands it is just that to remember those French names is just plain impossible for me! I also knew that wines could be red or white. I think that sums up about what I knew of wines pretty well. 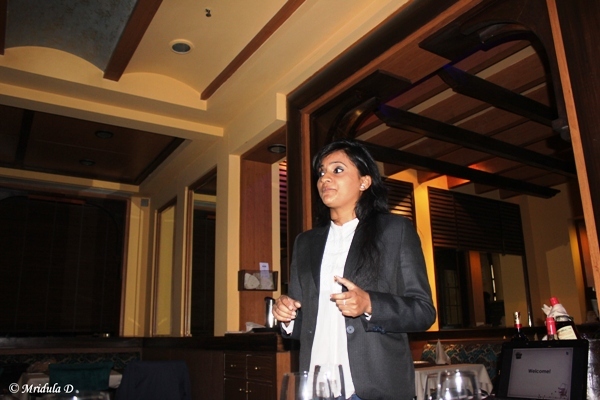 Then came Jyothi from Four Seasons. The venue was Ardor at CP, Delhi. Now I know a bit more about wines. First I realized that Four Seasons is a UB brand and it has been launched in 2008. Their vineyard is in Baramati, Maharashtra. Then I discovered that there is a red wine, a white wine and a rose (pronounced with the e and written with a dot over the e) wine. 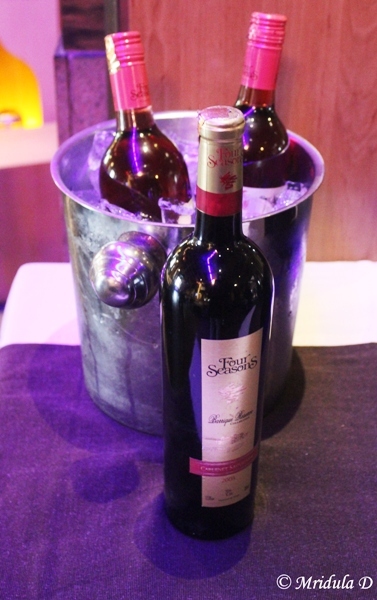 I tasted all three and I liked the rose wine (Four Seasons Blush) the most. I now know that red wine tastes dry, white wine watery and rose a bit more sweet. They can be combined with different food but as the food discussed was meat I started chatting with Nikhil who sat next to me. But I did so for a fleeting moment only. Then I discovered that you sniff a wine before you drink it, it tells you about the aroma. Have to admit I never did that before. Then they said you shake it so that more aroma is released. 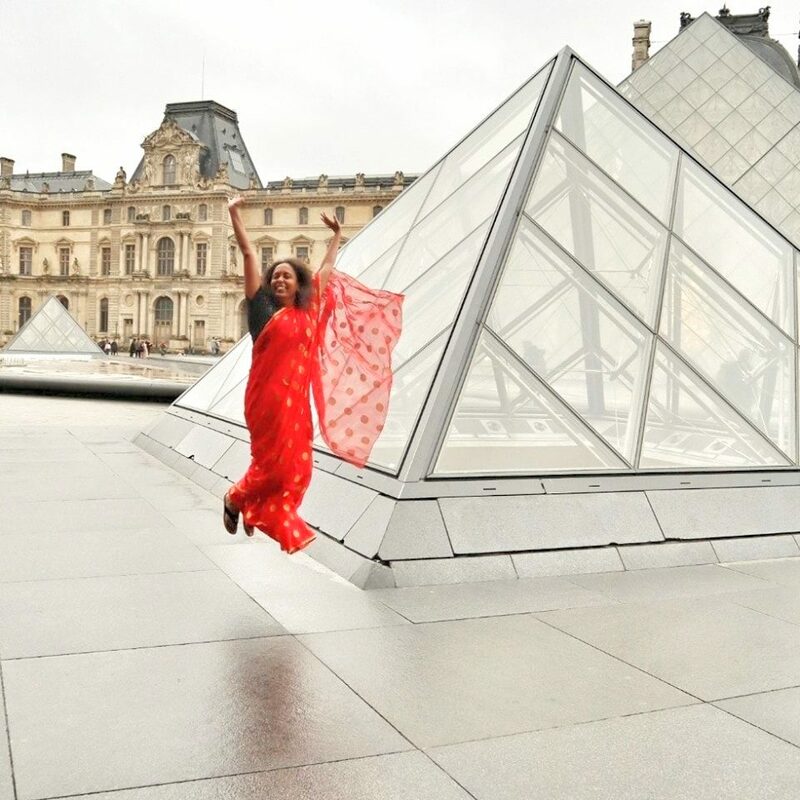 I did all that and I realized that the wine behaved exactly the way Jyothi wanted it to! And then I also discovered that Champagne is simply white wine, but not all white wines are Champagne. That is because only the white wine that comes from the Champagne region in France can be called Champagne. And not only wines can be red, white and rose they can be still, fortified, sparkling or aromated. Four Season as of now only produces still wines in India but they do import some other type of wines from France. Now whenever I take wine I am happy with one glass. So I enjoyed the rose wine and when I realized that I would be tasting Four Seasons Chenin Blanc and Four Seasons Barrique Reserve Cabernet Sauvignon I started telling the server to give me a very small fills. And I did fine, I enjoyed my wines and I enjoyed the veg starters and I enjoyed my evening. Wines are also divided into old world and new world. Old world wines come from the traditional wine producing region- Europe. The new world wines come from places other than Europe like Chile, New Zealand, India etc. I can still rattle of some more wine facts like you should look for the color in light and that the texture of a wine can be heavy, medium and light I guess this would do for today. I have to say that I am certainly going to look for Four Seasons wines when we go buying next, which will be probably the coming December. Apart from the December festival season the other time I drink wines is during international flights and there I have no control over what they serve me other than the red and the white.